I picked some flowers from my beautiful spring garden today. 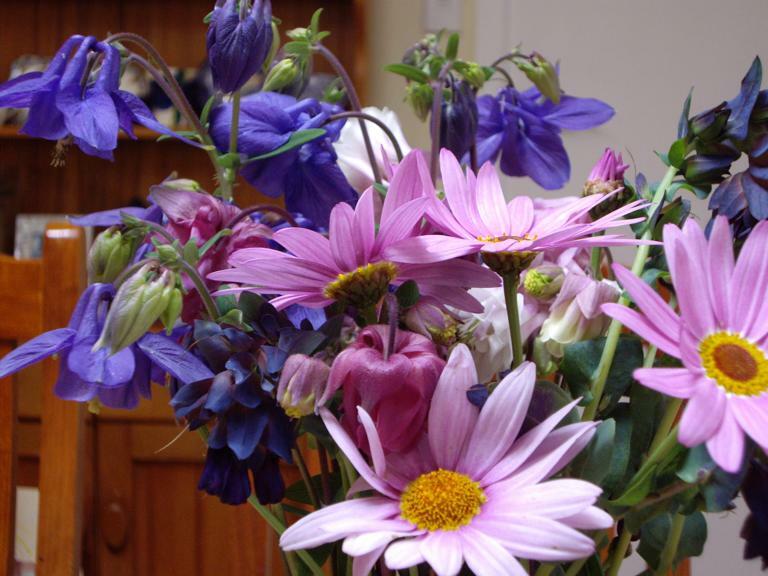 There are daisies, honeywort and columbine.I put them in a vase on the table, and sat looking at them really closely with my husband, and marveling at their complexity. A simple daisy flower is really lots of flowers! And the honeywort has leaves that look like petals. Strange. The columbines come in several sorts – the most basic one, that hasn’t been selected by the plant breeders for double petals, is still complicated. There are five petals like tubes, with a green spot on the end, and five others that flex backwards. All with little curvy bits on them. I started comparing these complex and beautiful fingerprints of God with my life – there’s lot going on for me at the moment. Dad died earlier in the year, and I need to support Mum and my siblings. My son has a temporary (we hope) disability which means he can’t walk, and has lots of hospital appointments. I have three essays due. My job situation has changed and there is no job description for what it needs to be. And that’s just the start – there are all the usual things to do with running a house, a family, and far too many baby rabbits. Is it complicated? Complicated usually means, “Don’t bother trying to understand, you wouldn’t anyway.” Or is it complex, like the flowers? I know that in God’s eyes it’s complex, rather than complicated. God understands all the strands of my life, much better than I do, and how they all interconnect. I just have to keep reminding myself of the fact! I keep thinking about how Christian pastoral care can reflect the caring nature of God. As a Deacon I have Supervision and Spiritual Direction. These are helpful, but they compartmentalize either me-and-God (direction) or me-and-everyone else, usually focused on work(supervision). When we represent Jesus to people we need to care for the whole person – spiritual, yes, professional, yes, but also health, family, whether the cat has fleas, the noisy neighbour who’s keeping them awake. In short, all the stuff that life is made up of, in its glorious complicated complexity. This entry was posted in garden and tagged body of Christ, choosing to follow Jesus, Christian community, christian life, columbine, daisy, disability, Faith, garden, honeywort, new zealand aotearoa, plants, pstoral care, rabbits, revfelicity, spiritual direction, spring, supervision, vocational deacon, Wellington by revfelicity. Bookmark the permalink.